Many dog breeds are known to spin in circles when they become excited. Whether they do it when you come home, prepare their favorite meal, reach for their favorite toy, or show them a treat, this behavior is not uncommon. But it should be considered uncommon when the behavior lasts many minutes, multiple times a day, or interferes with daily activities such as eating or going to the bathroom. If your dog repeatedly spins or chases it’s tail, it is a good idea to consult a vet about this. But if their spinning seems to be created by excitement and only happens occasionally, there is nothing to worry about! But the same question exists, why do they do it? Some believe that their actions/thoughts are conflicted and they don’t know what to do, so they spin in circles! Other professionals believe it may have to do with their ancestors that lived in the wild. It was a common act to circle 360 degrees to survey the land and their surroundings before sitting or resting. A tactic used to ensure they were safe from predators in the wild. This circling is also common before laying down. 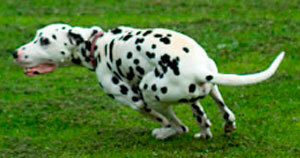 Circling before resting is believed to release the dogs scent which notifies others that this spot belongs to them. In summary, your dog may spin in circles for many reasons and it is important to note when they do it and how often they do it. The following table will help point you in the right direction as to whether you should be concerned. As you can see from the table, as long as it does not interfere with your dog’s regular activities such as exercise, eating, drinking, and sleeping it really should not be a cause for concern. But you should keep in mind that all dogs are different and if anything seems out of the ordinary, or a spinning behavior begins out of no where, it is always a good idea to consult your vet. You should not use this article as a source to determine whether your dog needs a professional opinion or not.